Colin Tizzard and his team felt that they had made too much use of Cue Card on his seasonal reappearance in the Charlie Hall Chase at Wetherby. So rather than take on the front-running Coneygree, Paddy Brennan had the 10-year-old anchored in almost last in the early stages and opted to play a waiting game. Seeyouatmidnight had pulled up before five out with Irish Cavalier was struggling and Silviniaco Conti beginning to come to the end of his tether. Cue Card had by that stage gradually crept closer to Coneygree though with French raider Vezelay stalking the pair. The latter could never quite get to the front two though, and coming off the home turn the race was between Coneygree and Cue Card, who hit the front three from home, seemingly full of running. He still hadn't shaken off the rallying Coneygree at the second last, but the former Gold Cup winner began to tire after that obstacle, leaving only the last fence in between Cue Card and a third victory in the Grade One contest. He safely negotiated that obstacle to claim a notable 15-length success and one which secures the first leg of a possible £1million bonus offered by Jockey Club Racecourses if he can add the King George VI Chase and Cheltenham Gold Cup to his haul. Sky Bet cut Cue Card to Cue to 9/4 from 4/1 for the next leg at Kempton Park on Boxing Day, while they also shortened him to 6/1 from 10/1 for the Cheltenham Gold Cup in March. 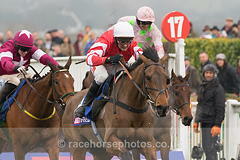 As the crowd rang out with three cheers for Cue Card, an emotional Tizzard said: "He means everything. We've got a few other ones now, but then he comes and does this. "He's absolutely sluiced up today and he's every bit as good as he's ever been. Paddy gave him an absolutely perfect ride. "He does like this ground - he sort of floats on top. He didn't have a hard race at all, did he? I'm just chuffed for the horse really, to keep on doing it. He's every bit as good as he's ever been. "He's got the best place in the stable, he can see everyone and he deserves it - he's our star. "He made it look easy today and it's fantastic for everyone concerned. He enjoys his life, he enjoys racing and wouldn't turn a hair coming here. He wants to be here at the races. "We all knew what Coneygree was going to do. He's had a year off, but he's a fantastic horse." Brennan was pleased to erase the memory of that defeat at Wetherby where the Cue Card team admitted getting the riding tactics wrong. "Colin and all his team at home had him in some form. I hacked him to the start and I knew then things were going to be so much different (to Wetherby) today," said the jockey. "Colin stood up for me at Wetherby, but he'd no need to. Things were just a bit quick for him and it was a combination of a lot of things. "Today he was the Cue Card I know, at Wetherby I never had that. When he's in the form he was today you can ride him any way you want - he's different class. 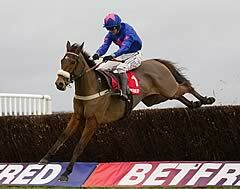 "We've had an unbelievable day today, Cue Card's shown what he can do. "Honestly, if I'd dreamt a thousand times in my life I never thought I'd be lucky enough to ride a horse like him. "I felt a lot of pressure today and I felt maybe it got away in the Gold Cup last year, but after today I think we've got a chance of putting that right." Connections of Coneygree said they were "over the moon" with the run of their charge on his first start for more than a year. Trainer Mark Bradstock said: "He jumped super, he'd been off a long time, so we're delighted," he said. "He's been off for over a year, so he is going to get tired. Coming to a Grade One first time out is quite an ask. "He jumped super, travelled great. It looked like he was really enjoying himself. Hopefully he's all right tomorrow."